http://lumberjocks.com/projects/11725 – it all started a January morning when i came across DrDirt’s post on lumberjokes.com I was looking for a simple mates bed set of plans, but instead I came across the race car Bed.i had just finished s 6in long Batman car, made of wood, for my grandson and figured, if I was able to do that, I should be able to do the race car!!! So I searched the internet until I found the proper Lambo Diablo GTR to base myself on, fired up my CAD software, built the model, did my bill of material and off to the hardware store I went!! 5months later and a lot of fix, sand and redo, it is done!!! The expression on my grandsons face, priceless!! Thanks Lumberjokes for reminding me that if you can dream it, you can build it!! Nicely done – - love the LED lights and the metallic rims. This is a very creative bed. Congratulations and welcome to Lumberjocks. Every kid’s dream. Those light looks great. Very nicely done! The lights are a neat touch. Sweet. Coolest Grandpa in the world. I’m sure the look made it ALL worth while! ...and the Lumberjocks Grandpa of the year award goes too…GrandpaMike. I love that you added the LEDs they’re like the icing on the cake. Thanks everyone, I appreciate the kind words. I’m just starting in wood working, this being my second project. I’ve updated 2 photos as I realized I did now show the drawers and headlights and toy box opened up…. I found it difficult to get any proper type of hinges for the project as the angle of the toy box is not 90deg. And to make it worse, how do you stop it from crushing the 2year old fingers!! What did you use for the plywood. I had made a second one (twin sized) for a school charity auction 6 or 7 years ago now. For the main panels I used MDO plywood (so a plywood core with an MDF face) which had no grain lines and painted really nicely. costs more – but for a painted project it worked great. @DrDirt, for the sides I ended up using some 3/4in Birch Plywood. It was “good both sides”. 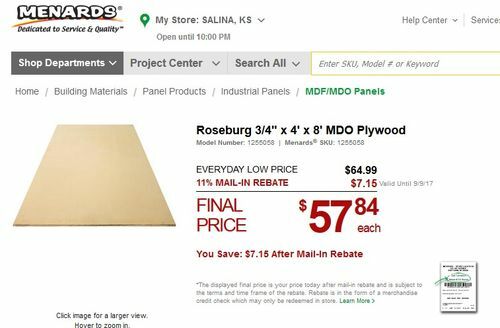 But it was not the “expensive” cabinet grade, but it probably could be used for Cabinets… This was a lower cost plywood, think it was $45can+tax at the local lumber yard.So that would be about $30us. The core of the plywood (when cut) had a lot of bad wood, empty sections and so on… So the core was “cheap”, just the top surface was the actual birch…So of course, lots of “fill” on the edges to hide all the holes…. Thanks GrandpaMike – - nice work – - when I filled the edges – I went with automotive “Bondo” polyester resin. @DrDirt, I did think of that as well, and I knew it would last longer – thinking of the beating cars go thru, but I wasn’t sure how the bondo would hold with the wood or have an adverse reaction with it. So I stuck to what I know…..but now I know better! Those little tubes of filler are expensive….. lol….lol… what I really had a hard time with was the paint!! I wanted a very smooth, high gloss finish…. had to watch many, many YouTube videos on “How to spray paint” , paint viscosity and more…. my gun was not right, my compressor was not right, my paint was not right… and on, and on, and on….. and don’t get me started on the chrome rims…. lol…lol…. there no proper chrome paint that will last at the touch!! They look good going on, but that’s it. The chrome comes off as you handle them…. and no top coat that works either… beat I came close to was Floor Finish, you lose the extra shinny portion and end up with a bright silver, but at least it doesn’t stay on the fingers anymore!! I saw this bed and I love it! I have a 10 year old son that I would love to build one. I have been a carpenter for many years and have the know how I just not really artist on the design side. Would you happen to have the plans that I can download or trace?